Nowadays Barcodes and QR Codes are widely used in lot of mobile apps. In a QR Code you can store information like text, sms, email, url, image, audio and few other formats. In Android you can extract the information stored in barcodes by using Google Vision Library. Even though there are lot of other libraries available, google vision library is best to consider as it’s not only provide barcode reading but also have other features like face detection, text detection. 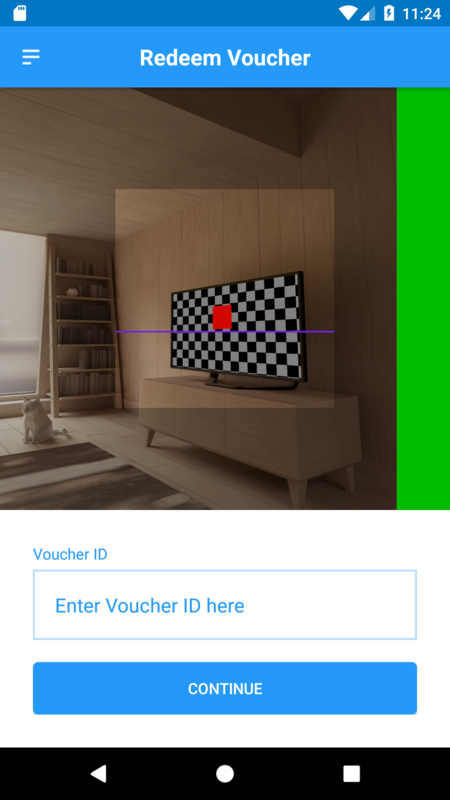 In this article we are going to learn how to use the google vision library by creating a simple movie ticket scanning app. Google Mobile Vision api helps in finding objects in an image or video. It provides functionalities like face detection, text detection and barcode detection. All these functionalities can be used separately or combined together. This article aims to explain the barcode detection with a realtime use case scenario. We can see lot of barcode scanning apps used in supermarkets, theatres and hotels which scans a barcode and provides user desired information. 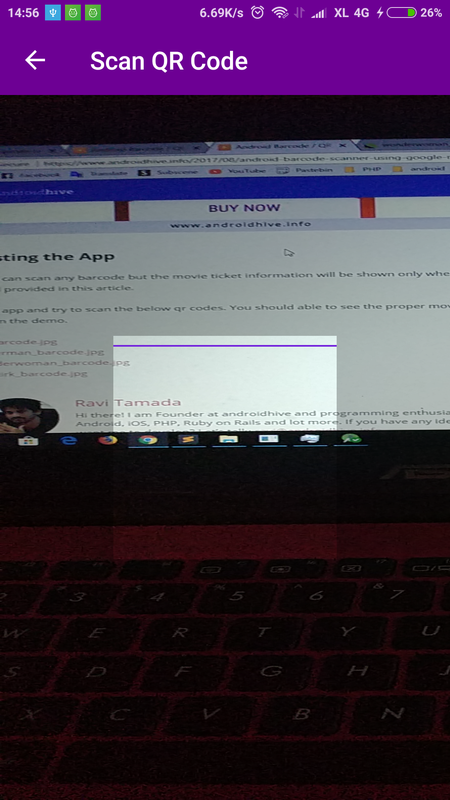 In this article we’ll try to build a simple movie ticket scanner app which scans a barcode / qrcode and displays the movie information to book a ticket. 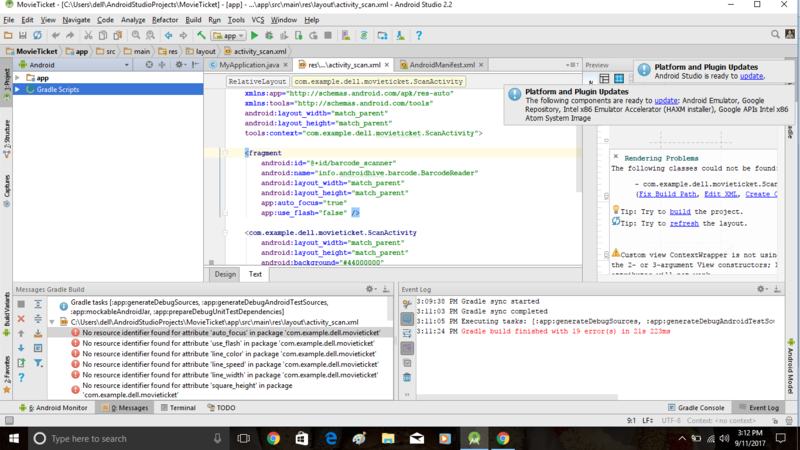 The google vision library is a part of play services and can be added to your project’s build.gradle. Google provided a simple tutorial to tryout the barcode scanning library with a simple bitmap image. But when it comes to scanning a realtime camera feed for a barcode, things become difficult to implement as we need to perform barcode detection on camera video. I have developed a simple barcode scanner library by forking the google vision sample. In this library few bugs were fixed and added other functionalities like callbacks when barcode is scanned and a overlay scanning line indicator that can be used in your apps. Follow the below simple steps to include the barcode / qrcode library in your project. 1. Add the androidhive barcode reader and google vision library to your app’s build.gradle file. 2. Add the barcode camera fragment to your activity or fragment. 3. Implement your Activity from BarcodeReader.BarcodeReaderListener and override the necessary methods. 4. Run your project and try to scan barcode or qrcode. The scanned result will be returned in onScanned() or onScannedMultiple() method. We can see all the scanning apps generally adds an indicator line on the camera overlay to indicate the scanning progress in going on. To achieve this, I have added a reusable class in the same library which can be added on to camera screen. To add the animating scanning line, add the info.androidhive.barcode.ScannerOverlay to same activity overlapping the camera fragment. The library also contains few other useful functionalities like auto flash, beep sound etc., Detailed information about library can be found on it’s Github page. As the barcode scanning library is already available, we’ll see how to use the library considering a real use case scenario. The app we are going to build not only explains the barcode scanning, but it also covers building the complex UI, making REST api calls to fetch the movie json and writing custom view classes. Overall the app contains three screens. The first is splash screen, second is barcode scanning and the last one is to display the movie ticket information. To build this app we need a REST api to search through movie database by movie barcode. I have written a simple rest api to search for a movie by barcode. This takes predefined barcode value as query param and searches it in the db. Here are the few sample barcodes for testing. Make GET request with the barcode value read. The matched movie json will be given in the response. Now we have all the necessary information with us. 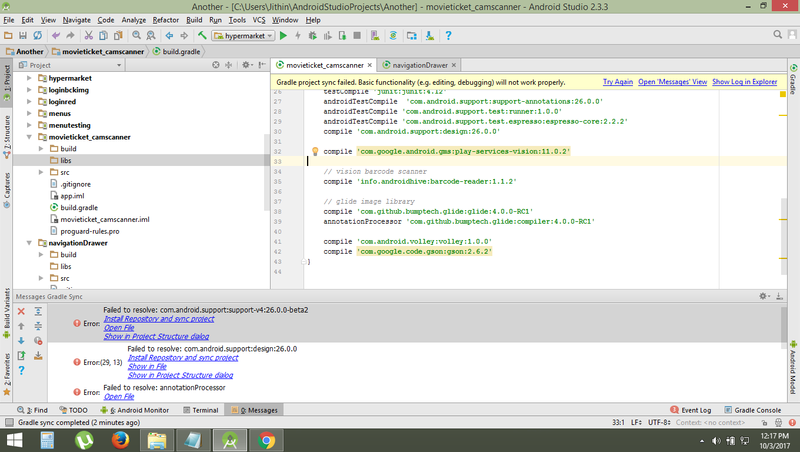 Let’s start by creating a new project in Android Studio. 2. Open app’s build.gradle and add the barcode and google vision dependencies. I am also adding Glide, Volley and Gson libraries as they are required to make http calls, json parsing and display images. 3. Add the below string, dimen, color resources to respective files under res directory. 4. Create a class named MyApplication.java and add the below code. 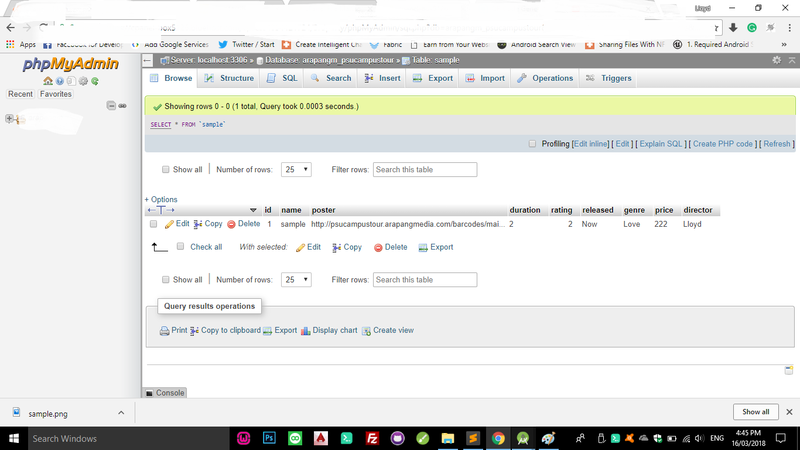 Here we create volley singleton instance. Volley is not suggested for making http calls, but to make the integration simple, it’s considered in this tutorial. Consider using Retrofit in your production apps. 5. Open AndroidManifest.xml and add the MyApplication class to <applicaton> tag. Also add the INTERNET permission as we need to make http calls. 6. Under res ⇒ drawable folder create an xml drawable named bg_gradient.xml This drawable gives gradient background to view. The landing screen will have few text fields and a button to open the scanner camera. The interesting thing you will learn here is giving gradient background to activity. 7. Open the layout file your main activity (activity_main.xml) add the below layout. Here we are adding button to launch scanner activity. 8. Open the main activity and do the below necessary changes. In this activity transparentToolbar() method makes toolbar transparent. The button click listener launches the scanner activity which we are going to create shortly. If you run the app, you can see the landing screen as below. Now we have the landing screen ready. Let’s create the scanner activity. 10. Open layout file of ticket activity (activity_scan.xml) and add the Barcode Reader fragment as below. Here we are also adding the scanner line indicator animation view. 11. Open ScanActivity.java and do the below necessary changes. > Override the callback methods onScanned(), onScannedMultiple() and other callbacks. > barcodeReader.playBeep() plays beep sound upon barcode is read. > Launch the TicketActivity once the barcode is scanned by passing the barcode value in intent. Run the app and try to scan any barcode. The scanned barcode will be returned in onScanned() method. The next screen will be ticket results activity. On this screen the movie details will be displayed by sending the scanned qrcode to search endpoint and get the result. If you observe the design, I have placed the movie details on a ticket view which will have punched holes in the corners. To achieve this I have created a custom view and made the holes using eraser. 12. Create a class named TicketView.java. This is a plain view class in which the Canvas is used to render the view with transparent holes on the corners. 13. Create new class named TicketResultActivity.java by navigating to File ⇒ New ⇒ Activity ⇒ Empty Activity. 14. Open the layout of ticket result activity (activity_ticket_result.xml) and add the below layout. 15. Open the respective TicketResultActivity.java and modify the code as below. > searchBarcode() makes the volley http call to search endpoint by passing the barcode scanned. > renderMovie() parses the json and renders the movie details on the screen. Now if you run the app and scan the qr codes provided in this article, the results will be shown as below. The app can scan any barcode but the movie ticket information will be shown only when the qr code is scanned provided in this article. Run the app and try to scan the below qr codes. You should able to see the proper movie information as shown in the demo. Thank you so much for another great tutorial! You are a specialist! Hy @ravi8x:disqus Thanks for the tutorial how to solve this issue..
Gradle sync failed: Could not find method implementation() for arguments [info.androidhive:barcode-reader:1.1.2] on object of type org.gradle.api.internal.artifacts.dsl.dependencies.DefaultDependencyHandler. Currently iam not using android studio 3.0 can i use this tutorial..? or you can refer another tutorial for this..? The barcode library works with any Android Studio version. 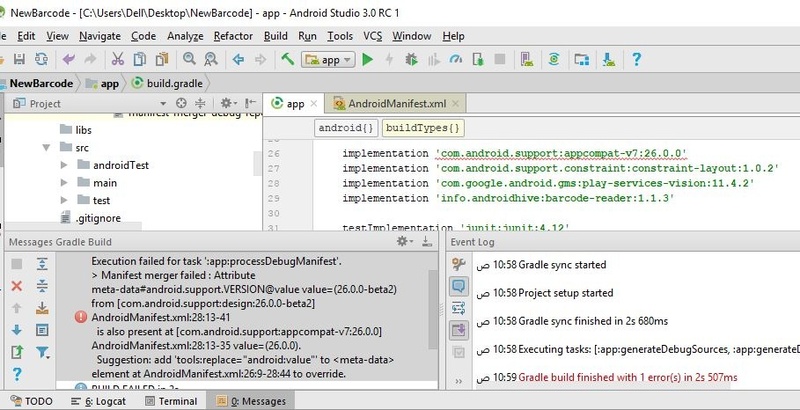 If you want to try this tutorial in Android Studio 2.x, replace implementation to compile in your gradle file. You might face other errors too but can be solved easily. It’s really very nice tutorial with your own Barcode reader library. Great! great……Firebase is blocked in my country im working on a project that iwant to send notification when new data inserted to mysql …could you please guide me….im sorry my question not belong to the topic above ..thanks in advance. I am waiting for a tutorial on fragment navigation with animation. Any example of the animations you are looking for? Why Volley is not recommended? It’s not actively developed and it’s lack of lot of features. Volley is better smaller network responses. Retrofit has more benefits than volley. how to make it offline apps :/ ? Barcode can be detected offline, but in order to fetch data of barcode you need server. A simple text can be stored in barcode if that fulfils your app requirements . Can you launch a tutorial on creating a news app with cards layout or something similar to Google news. Looking for the Article from long time. Paste your complete xml code. Hi Ravi – Thanks for the great tut. Also what does the data endpoint look like? The php/api and the MySQL bit. I am not using mysql. It’s all plain json. The php file reads the barcode value and echoes the json data by file name. Ex: if the barcode value is spiderman, it echoes spiderman.json file content. That’s all. Aha.. thought as much.. Google’s RT DB maybe.. So thanks for confirming. Yup, the main theme of article is not the API. Thats why didn’t gave much weight to it. Please I’m having a problem. The app is not reading the barcodes. It just keeps scanning. Same thing happened when I downloaded the .apk file. As usual Ravi Tamada. very gud tutorial again….experting tutorial on Rxjava from you. Can you please do fb, twitter and g+ integration tutorial ? No, consider using Firebase Federal Login. I hope it has to be info.androidhive.barcode.ScannerOverlay instead of your com.example.dell.movieticket.ScanActivity. then how to solve this problem plz help me. how to add custom url to buy now button? Have you added the androidhive barcode library in gradle file? 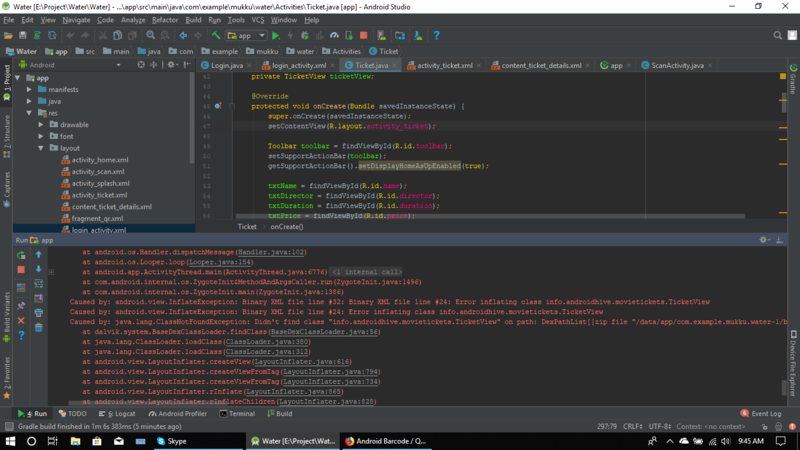 Try cleaning & building the project from Build menu option in Android Studio. 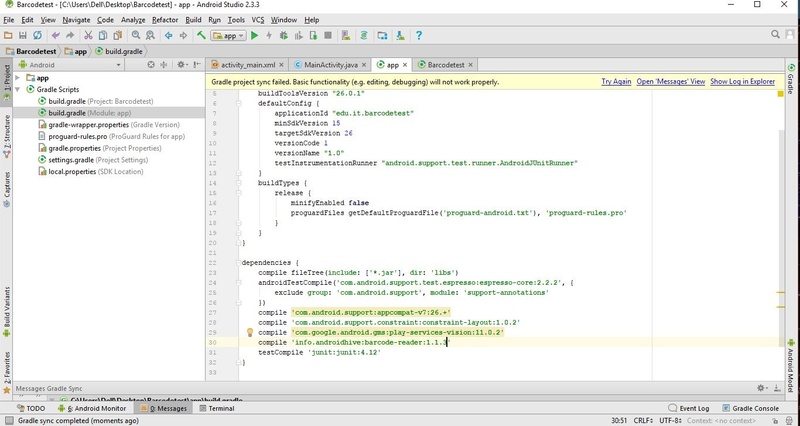 Have you added androidhive barcode reader dependency in build.gradle? How to flash on/off programatically? is there no other way to fix this error sir. it would really be helpful if you could help me out. camera result is not good when use this code inside Fragment. Me too have same issue. 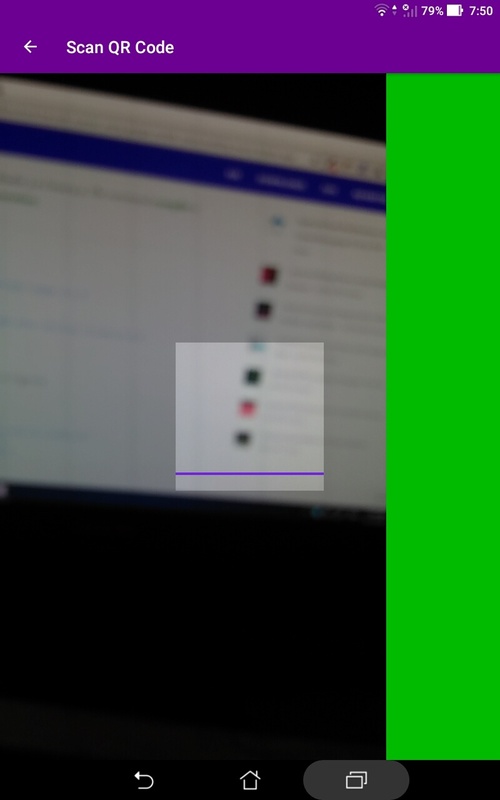 The camera is not showing full screen in fragment. It is taking around 1.5 sec to intent from ScanActivity to TicketResultActivity. So is there any way we can optimize and reduce time. Very Nice Tutorial. Thanks !! Great Tuto. Please could you also post the PHP code here? There is no logic involved php. It just prints the json file by file name. hey, did you solve this exception because i have giving same exception. please let me know if you solve. Have you added the androidhive barcode library to gradle? yes i added barcode library. In my application i used bottom navigation view so that i added scanner in fragment that’s why its giving android.view.InflateException: Binary XML file line #0: Error inflating class fragment exception. but i couldn’t find any solution. Can you post your layout code? Seems the below code is wrong. It won’t take use_flash or auto_focus properties. Try removing unnecessary attributes. Try it in a different Package it is working for me. 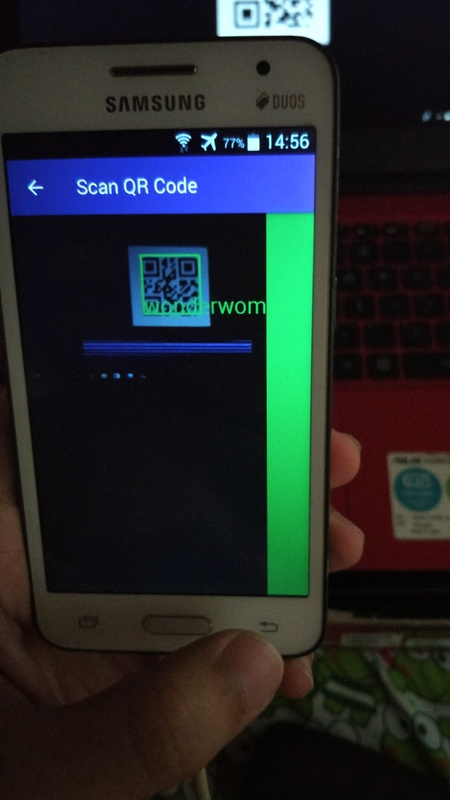 samsung mobiles android version 4 can’t scan QR code , do you have any solution for that ? Is there any error report to debug? 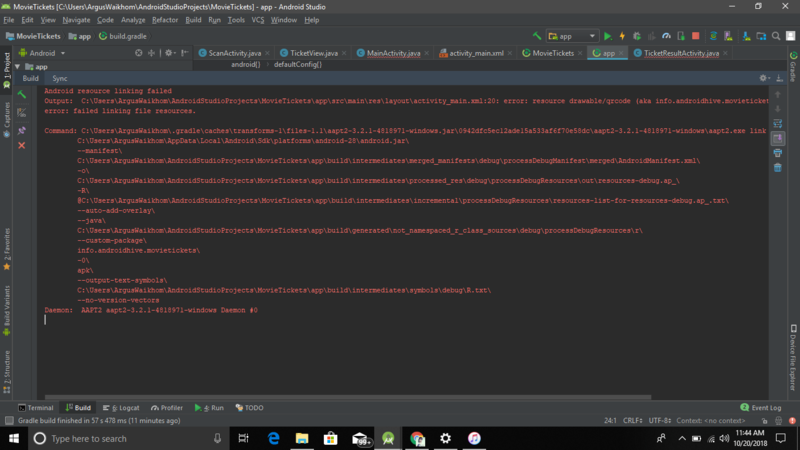 i give android.view.InflateException: Binary XML file line #0: Error inflating class fragment exception in fragment. how to add BarcodeReader in fragment. How can I download your barcode reader library ? You can just include the dependency in build.gradle or download the source code from github link. `26.0.1` instead of `26.+` ??? It’s there on Github page. I have added this library in a view pager. I am facing an issue with barcode view in which camera view get starched. Please suggest me a solution. How can we resist the fragment from stretching the camera. Images are stretched while scanning. I’ve posted images in git repo issue. Could you check that once, if possible. Nice work, and thank you for tutorial and share code. Btw, when camera open to scan barcode, some display is green, how to fix it and make itu full screen. Which device you are testing it on? I order device from Tiongkok, the name is wangpos. How can i make it full screen? Which device / os version you are testing it on? I have same problem and i removed actionbar and it display perfectly. Do we have any other solution? 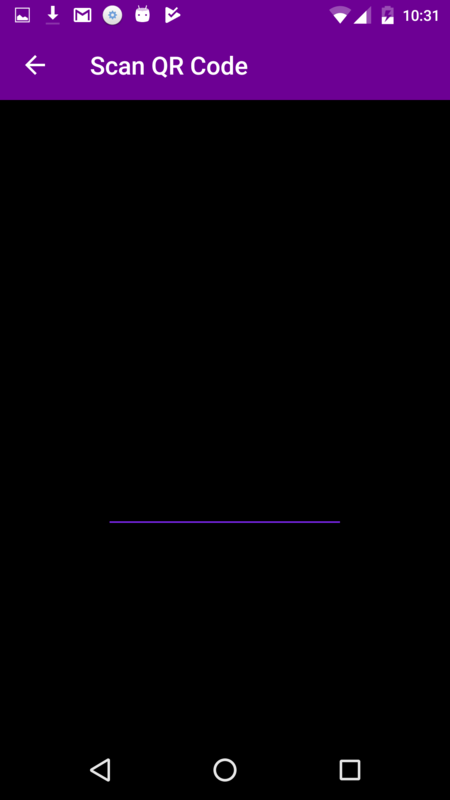 I get this problem to, when first time launch and allow camera permission, scanner is black.. until the app closed and then it will running well. it just when ask permission. Please check the library in the evening. Somebody fixed this issue and pushed the changes. I’ll deploy the newer version of the library and notify you once done. The Github button is there at the beginning of the article. Have you included the google vision dependency also? It’s required. Try latest version of play services libraries. make sure all the google services are using the same version. Clean the project and build again. My app require multilingual support while scanning QR code, like if i generated a QR code by using hindi text or some other language then scanner should scan that language text only. Hope you will find any way to do this. It would be helpful for me. Thanks in advance. The scanner will always scans the QR Code. You have to decide whether to show next UI on qr is scanned or just ignore the scanned result if it’s not from the same language. 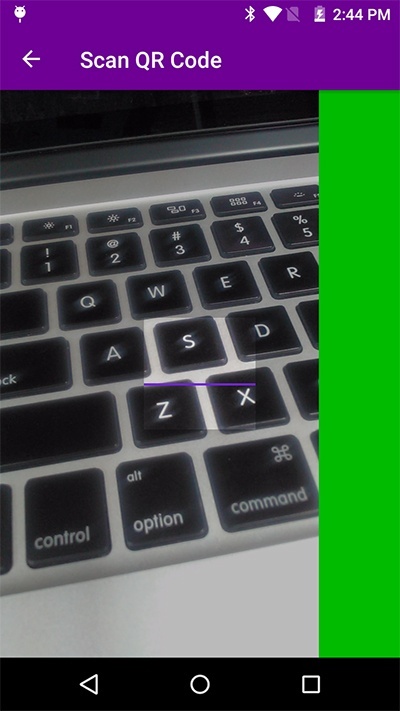 I am generating QR code by typing text from other language keyboard, its working fine. now i am going to scan that QR code from by using vision lib but it shows “???? ?” this string. i want to get back that language string. onScanned(Barcode barcode) is not invoking for me. Sir, what is qrcode in drawable folder? 1 how can i hide the green url in the box when its scanning? 2 Why my camera in zoom? I made search.php very simple as it’s not the main intent . It just opens the file and prints it’s content. Hey, I have a bug when i going back from scanning result. Moving line from scanner square escapes from him. This only happens when I’m turn back to ScanActivity from other Activity. What can i do with it? Hi Ravi, its a nice tutorial, is there any way to make use of front camera for scanning instead of back camera ? You need to customize the library. You need to set the camera id before opening it. Keep the front camera here. Yes it will. There is a callback to read multiple qr codes. How to fix camera not autofocus in google vision read qrcode? camera is blur when scan qrcode. You can send for me source code demo fix autofocus, I’m try but not success. Can we set “use_flash” programmatically. I think yes, need to recheck. if it possible please reply me as soon as possible. I think I have removed flash programatically. The library has to be modified. Please explore the library. can u tell me how to create barcode or barcode .jpg you have? I used online service to generate them. Are you there any errors in LogCat? How are you parsing the json? I am not clear what the problem is. can you explain me, what are logic used for get jsonobject? I used http://www.barcode-generator.org/ to generate the barcode images. Im facing the same error. I got json data successfully and converted the url link as qr code, while i scan the qrcode its shows me “No ticket Found”..
Can you share barcode scan through gallery images ? hi Ravi! please can you share the content of the https://api.androidhive.info/barcodes/search.php??? I am just reading the file by its name and printing the json. Not reading the data from a database. there is no link for dunkirk_barcode..please update the link. Hi Ravi please help me to scan 1D barcode scanners as well..
Hi, why did not the camera show the real thing? but become wider? Hi, why the camera become stretch in my phone xiaomi mi 5 Android 7.0 API 24? and in my phone samsung galaxy core 2 API 19 Android 4.4.2 the have green screen and text https://uploads.disquscdn.com/images/baccf413e6d6f799add1def6933b437e897db71e31a400c492d86cd25387dcc7.jpg in qrcode scanner? 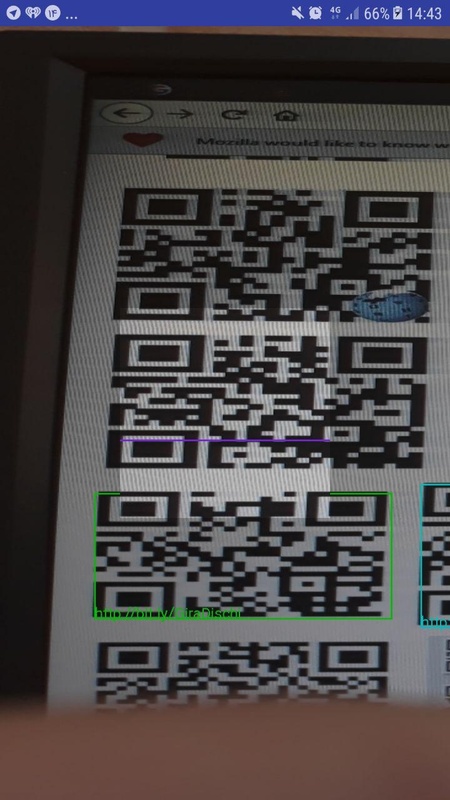 I got json data successfully and converted the url link as qr code, while i scan the qrcode its shows me “No ticket Found”..
How can I pause/stop the scanner after scanning one barcode and resume again after completing some task? There is a method to pause and resume scanning. Usually the server contains list of barcodes in database along with movie details. In android app, when a barcode is scanned, it contains a unique identifier / string. We need to send this string to our server, the server performs a search and gets the matched movie details. The url I have provided exactly does the same, but for now it has 4 movies only. Should I create a database for barcodes? 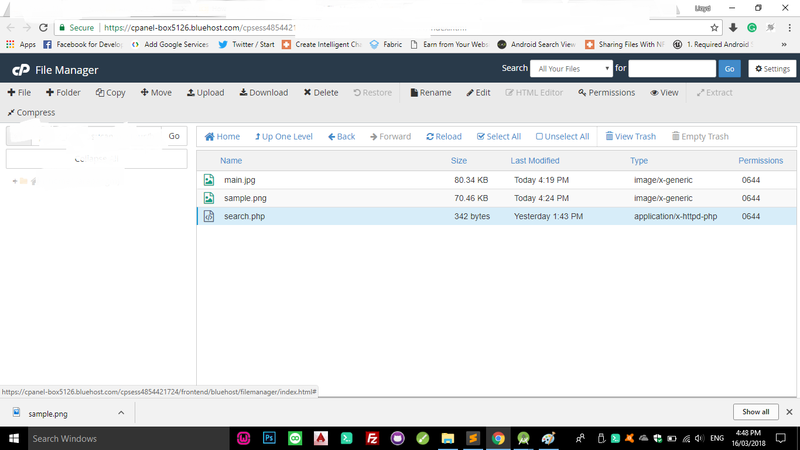 or just place it i file manager of the server? Usually it should be database only. For demo purpose (and avoid creating a database on my server), I have kept static files. Thank you Ravi for supporting me, One last favor, Can you explain to me on how to create my of qr code server and database. And the search.php, I placed it in server? Where should I place this, please answer me. Guys can you help me on were and what are the things to do to connect my own database to android. I don’t get the server or database side. What shoul I put here? Ravi, can you share to me the rest api? or please help me or explain to me the db side of this proect? Hi guys anyone who could help me? Which url should I generate to qr code? Because after I scan the qr code its shows me “No ticket Found”.. Anyone who could help me please? Your tutorial was great.. I would like to use front camera for reading the QRCode, could you please help me for that? How to make the camera looks nice in portrait mode? if i use it in lanscape mode it looks normal but not in portrait mode like cropped view. is there any solution you got?? Actually i had to make the scanner look landscape and it’s working normal now. Change the screen orientation to landscape. hmm okay.thanks but is there any solution for the portrait mode?? Hi Ravi, I have used your code. I found that you ask run time permission for Camera, but I don’t want that permission how can I disable that. How do I set the square_height & square_width from java code based on screen size. I used your code in my app, it is awesome. When I try to scan a barcode it can able to read the barcode out of the box(the barcode which is out side of the Scan overlay box). can we restrict the camera to scan the barcode within the Overlay box only.? Can I get a possible reply on this? I have a list of barcode images on a sheet. I edited scan overlay box to fit only one barcode into to. But when I try to scan a barcode inside the scan overlay box, the barcode outside the overlay box is scanned. The current library won’t consider the scan overlay area. It’s just mimics the UI but not the functionality. but no response , please help me .. I am not sure Ramkesh. It’s happening in few devices. Thanx Ravi, i will sort it out with its best possibility’s. Thanks Ramkesh. If you found the solution, possibly raise a pull request to repo. So that can test and merge the changes into library. Hi Ramkesh, did you get solution for this ? As I discover that barcode scanner is not working on android tablets due to lack of auto focus feature and there are many articles saying the same …but @ravi8x:disqus in this situation can we take the picture of the QR code or barcode and then we can pass that bitmap for decoding and get the barcode text from that bitmap. Is it possible? We can do that but it won’t be realtime. Instead why can’t you get the code from github and add auto focus support? Is internet connection is need for google vision library ? 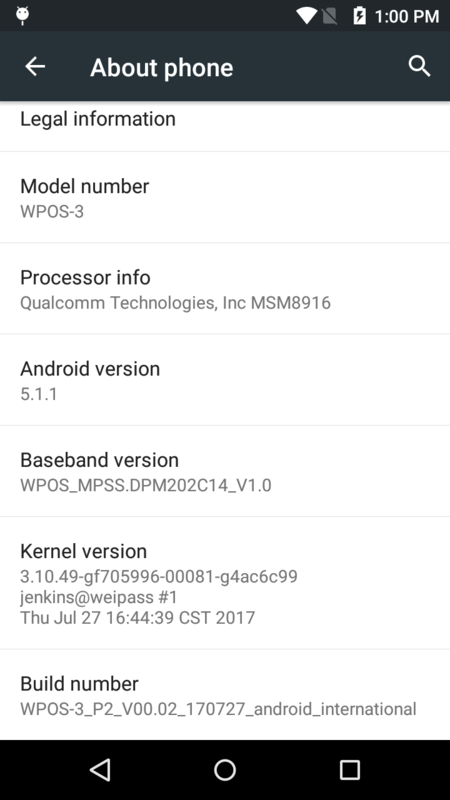 Android 7, API 24 – camera image getting stretched. Do you find any solution on that? No man. I am yet to fix that issue. but not working for 8.0, working for below versions. i m also facing same problem, its not working working with higher versions, is the issue resolved? implementation ‘info.androidhive:barcode-reader:1.1.2’ this api is free or paid. App is working perfectly but camera stretch in android 7.0. Have to deliver to client and facing this issue. Any one can give any solution plz. and congratulations for the article. I tried the application and it works perfectly only that I noticed that on some smartphone models the camera alters the image stretching out it and in some cases compromising its operation. Can you tell me what the cause could be and if is it possible to correct it? I am yet to fix this problem. I am expecting that the issue would be to be screen resolution. You can explore the Camera classes in the library. I think it is coming from @+id/topLayout. Hi Ravi,Thanks for the great informative tutorial!!! Like, some other guys , I am also having an issue of image flattering in android 7.1. API 25. Have you fixed it? Great work! Is ‘1.1.5’ more recent? May be you can send a pull request if you think this fixes the problem. Multiple items detected onUpdate: 2 which i am unable to resolve 🙁 . Can you please help me with this ? Hi Ravi, Thanks for a great tutorial. I have just 1 question – What unique identifier / string did you insert into each qr code/barcode? same issue any solution ? I using this code and it works perfectly. But on some devices camera stretching the view. Is there any solution for that so we can try that. Output: C:UsersArgusWaikhomAndroidStudioProjectsMovieTicketsappsrcmainreslayoutactivity_main.xml:20: error: resource drawable/qrcode (aka info.androidhive.movietickets:drawable/qrcode) not found. Downladed apk is not stretching the camera. But when I run the code camera stretches. Please help me. @ravi8x:disqus brother, I am getting camera stretching issue above devices 6.0. I checked last comments which are approx 8 months old but didn’t get any solution. Is there any quick solution to fix this issue? @ravi8x:disqus awesome tutorial. Can we expect more content like creating our own views just like what you did here ? Yes, I need to publish one. Usually the screen won’t be visible right after barcode is detected? my query is.. Some time i scanner working perfect but some time show the stretched screen ..please tell me the solution. Yes, I have noticed it. Need to debug and release a new version. Using Tablet, Image is showing stretched when scanning vertically. Horizontal orientation is not having this problem. Please advise. great job sir.. but i am running the app on android pie which is not supported by this library.. what should i do?